Barack Obama has been re-elected as President of the United States. Thankfully, there is a winner with a significant margin meaning that there is not a repeat of 2000. Twelve years ago the result was decided by the US Supreme Court after the controversy over 'hanging chads' and 'butterfly ballots' in Florida. However, had the election been tighter, would this have been the case? What is clear is that problems remain with the administration of elections in the US. Across the country, lengthy queues formed at polling stations. 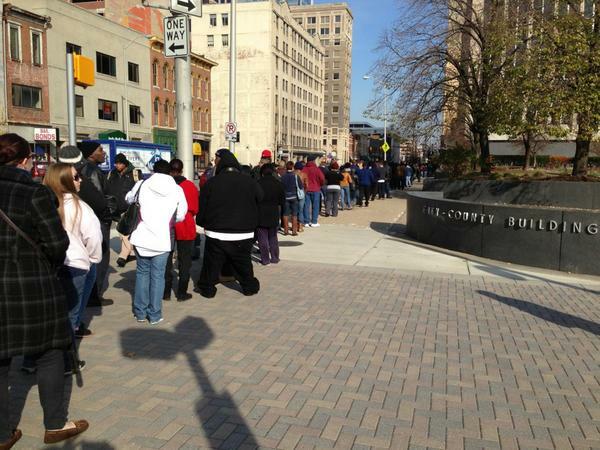 An election official from the Marion County Election Board, Indianapolis, Indiana tweeted a picture (below) demonstrating the length of queues forming at one polling station. Did voters patiently wait or vote, or did the queue deter them? '[W]e did lose a few who didn't want to wait', admitted the election official. Elsewhere, there was widespread confusion in Philadelphia. Republicans had sought to introduce a voter ID law but a judge ruled that implementation should wait until after the Presidential election. Widespread confusion ensued among voters and poll staff. Was ID required or not (in fact, it was needed only for first time voters)? There were reports that some poll workers and 'election observers' were deliberately asking for voter ID, even though it was not required. One tweeter (below) posted a picture of these signs that they found and took down. The US, often held up as a pillar of democracy, has a darker side to its elections. Often these problems are a result of deliberate strategies of vote suppression. Politicians and their agents perceive that they can gain electoral advantage from discouraging their opponents’ supporters to vote. Voter ID laws have been shown to be particularly 'effective' at reducing turnout among certain populations. They are also a useful method for threatening voters at polling stations. Another tactic is deliberately under-funding election boards. The Marion County Election Board, referred to above, complained that they wanted more poll sites, but 'Republicans had vetoed our resolution for more at each election since 2010' (sic). In Florida 2000, it was areas dominated by Democrat voters that saw the greatest queues form - areas which suffered from under-funding. Republican politicians held the purse-strings. Problems are not always caused deliberately. They can stem from failures of electoral management. Poor planning on behalf of electoral officials and a lack of training can lead to problems for the voters. Some polling stations, including some in Ohio, ran out of ballot papers. In Miami-Dade County, host to the problems in 2000, scanning machines broke down leaving voters to queue for hours. Further problems will problem emerge over the coming weeks. There is an urgent need to understand how failures of electoral management can be avoided (or reduced). They are not the reserve of newly democratising countries or electoral autocracies such as Russia. They also take place in the US, and, as scenes from the 2010 general election demonstrated, the UK. The UK Electoral Commission has developed some strategies for improving election administration which my research has suggested has had some positive effects. However, academics and policy makers should work together to find ways to improve elections. Efforts to suppress legitimate voters require rigorous scrutiny from the media and public. Thankfully, the 2012 election appears to have been decided by the voters, not the administration of votes. But things could have been very different.